This bereavement gift can honor the memory of a child and bring some peace and comfort to a grieving parent. The loss of a child is something that no parent should ever have to face. When our children are young, we dream about their futures. We wonder what they will become, what dreams they will chase. But when a parent loses a child when they are young, the world Stops. Turning. And it is impossible to think how we can pick up the pieces and carry on with living. Coming up with the right words to stress your sorrow and compassion for those who have lost a child becomes very much a realization of the impossible. You want to express the ache you feel in your heart for the family with respect but you can’t quite find your voice. That’s where the loss of a child bereavement gift from Captured Wishes can help. This symbol of the eternal tears shed for the child will gracefully respect and reflect that the child may be gone, but never forgotten. Your thoughts are always within reach how you share the burden of the loss. This wish vessel knows of the tears. How many are shed for the child will never be accounted for, only that they began. It measures 40mm x 15mm in size and is filled with a blue holographic glitter symbolic of tears of loss - countless, true and beautifully devoted towards grieving that which will never be. 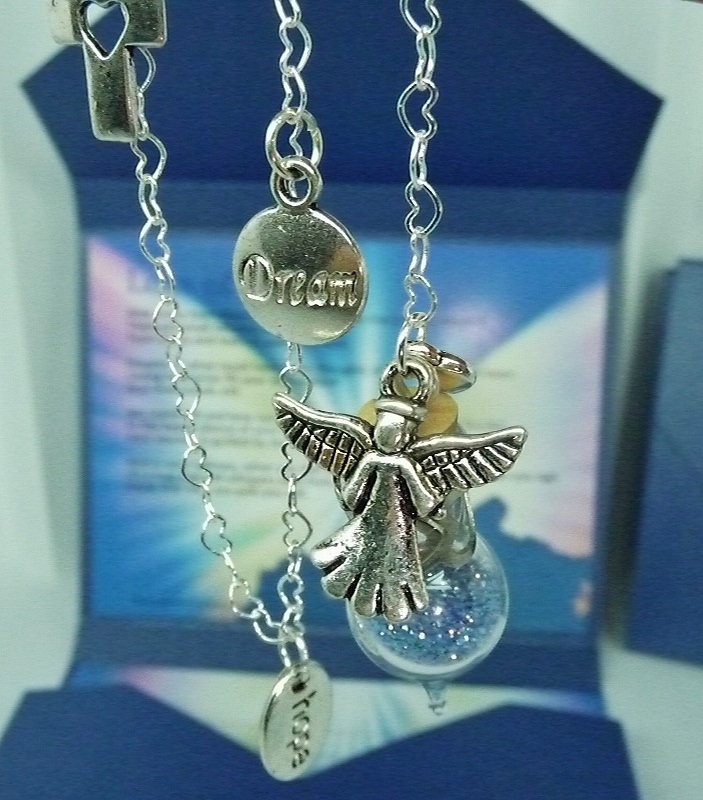 Adorned with charms of hopes and dreams, they are joined by an angel charm for precious keeping in the heavens. Accompanied with an eloquent message card, this is a way for you to offer your own personal condolences or relationships, shared sorrow and extra personal expressions of bereavement. The piece can even be customized to include the initial of the child. Note, the design of this style is for children ages 4 to young teen, unlike the design for miscarriages and newborn to toddler age which can be viewed and purchased here.